Legendary Scottish rockers Big Country are the latest headliners announced for the main event at Brewood Music Festival 2018. The band will line up alongside The Legendary Osmonds at the bi-annual event, taking place on Saturday 14th July 2018. Big Country were one of the biggest bands of the 80s, boasting a stunning catalogue of great songs including ‘Fields of Fire’, ‘Chance’, ‘In A Big Country’ (which sold 2 million), ‘East Of Eden’ and their biggest UK hit ‘Look Away’, along with massive albums such ‘The Seer’, ‘Steeltown’, ‘Peace In Our Time’ and the triple Grammy –nominated, ‘The Crossing’. Big Country join the Legendary Osmonds as headliners of Brewood Music Festival 2018, appearing alongside highly rated Penkridge four piece Sugarthief and Shrewsbury blues sensations The Rainbreakers. 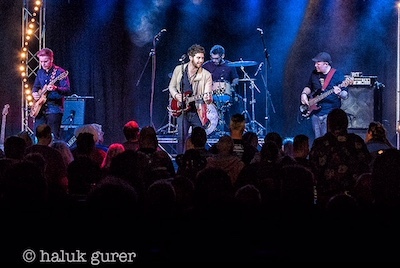 Sugarthief have recently finished a highly successful stint supporting The Twang on their recent tour and already have a string of high profile dates in the New Year. They have enjoyed a fantastic 2017 gaining extensive radio play as well as cementing their burgeoning reputation as a hot young live act. Rainbreakers, a four piece outfit from Shrewsbury, have been hailed as one of the freshest new sounds in the UK blues rock and soul circuit. The band has developed a distinctive sound that embodies a fusion of dynamic musical elements that bridges the gap between Blues, Rock, Pop and Soul. The band are particularly fascinated with the sounds of the past, ranging from soul melodies and psychedelic sounds to garage-rock riffs and R&B grooves. Ticket sales will recommence in the New Year, although a handful of early bird tickets remain at Village Flowers in Stafford Street, Brewood priced at just £20 each. The perfect solution for that last minute Christmas gift! Be sure to hurry though, they won’t last long!